Welcome John W. Howell! I just finished this thought-provoking and very enjoyable read – a blend of mystery, friendship, and family, with a helping of supernatural. Get your copy now – the price is only 99 cents until November 1st! I am introducing a new book this month titled Circumstances of Childhood. It is a fictional story of family life. Greg and his boyhood pal dreamed of big success in professional football and then later in business. Greg was the only one to live the dream. Now the founder of an investment fund Greg is faced with a routine audit finding by the SEC. The review points to irregularities and all the tracks lead to Greg. The justice department hits him with an indictment of 23 counts of fraud, money laundering, and insider trading. His firm goes bust, and Greg is on his own. My favorite Halloween costume as a child was dressing up like Hopalong Cassidy. I know, I know none of your readers have even heard of Hopalong let alone can they visualize how he looked. Let’s just say he was a cowboy with high boots and two six guns. Man, he was so cool. My nightmare neighbor would be Jason from Friday the 13th. I saw the first movie, and it scared the bejesus out of me. They also had an actor in the theater jump out from behind the curtain and run up the aisle at the end of the movie. He convinced me that he was the bogeyman. When I was a kid, we had a show called “Space Cadets. I wanted to be a space cadet and travel to Mars to check out the neighbors. I also wanted to be an astronaut but very quickly gave up that desire after a ride in a g-force trainer. My inner ear still is off. I jump into a new project immediately. It is almost as if I’m possessed. I just can’t stand it when I’m not working on something. In fact, my new release Circumstances of Childhood was in the rough draft phase when I began the next book. I can’t help but like my protagonist in the three books of the John Cannon Trilogy. He has developed into a solid character with some traits that I would like to have. He is very calm under fire and can reason with extraordinary circumstances in ordinary ways. He is not rattled easily and holds his own in situations where the odds against him are overwhelming. He also has a relationship with Stephanie Savard of which I’m jealous. When I first created John, I thought he would be a typical lawyer type. You know bottom line orientation and a no-nonsense style. John fooled me several times by refusing to be confined to the role I had mapped out. I’m pleased to say John has turned into the kind of person that I would be proud to call a friend. John began his writing as a full-time occupation after an extensive business career. His specialty is thriller fiction novels, but John also writes poetry and short stories. His first book, My GRL, introduces the exciting adventures of the book’s central character, John J. Cannon. The second Cannon novel, His Revenge, continues the adventure, while the final book in the trilogy, Our Justice, launched in September 2016. He is currently introducing Circumstances of Childhood a fictional story of family life. All books are available on Amazon in paperback and Kindle editions. I can’t even imagine a guy jumping out after Friday the 13th. Horrifying! Talk about childhood trauma. Hahahaha. Sadly, Sue, I was an adult and still carry the trauma.Thanks for the visit. I’d have loved to see that! You’re welcome, John – anything I can do to help. But not kicking in on any therapy bills. Nice seeing you over here today, John. If anyone reads the comments, I can vouch for all of John’s books. 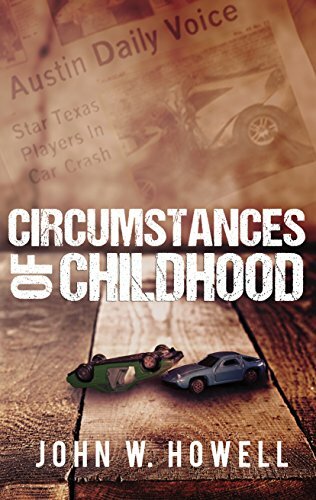 99¢ is a steal to get your copy of Circumstances of Childhood. 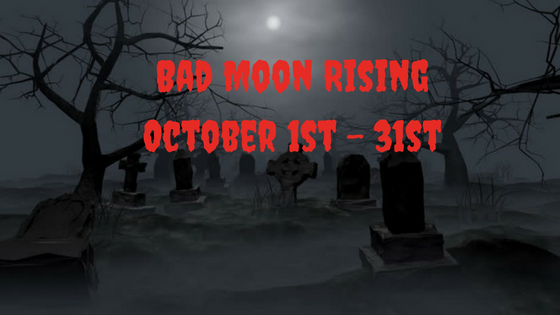 Teri Polen has a feature this month titled ” Bad Moon Rising, ” and she has a different guest each day. Today I’m there, and I hope you visit and have a look around. You won’t be disappointed. Hey, John, I remember Hopalong Cassidy – my brothers and sisters and I never missed an episode! I loved this interview and your responses. (Applauding both Teri and John). It’s great seeing you out and about in the blogosphere. Thanks, Mac – always a pleasure hosting John. Thank you, Michelle. So glad you stopped by. When I said Hopalong Cassidy Teri went, “Wait what?” Ha ha ha. Kudos to Teri and John for the great interview. It was a delight! Thank you so much, Gwen. I got the boots for a Christmas present and had to wait forever for Halloween. LOL! Any pictures of you as Hopalong? How cool that you and Gwen are writing a book together! I should have required pictures! Hindsight and all. Hey, John, I know the name Hopalong Cassidy. I think I might have even seen an old B&W episode once—it was a TV show, right? I’m 80% through Circumstances of Childhood and should have a review coming soon. It amazes me how diverse your plots are, having read your John Cannon series too. The next book sounds equally awesome. The diversity from John Cannon was also something I enjoyed, Mae. From his blog posts, I already knew John’s mind was a interesting place to hang out. I agree Jason would not make a good neighbor! How exciting that you and Gwen are writing a book together… Can’t wait to read it:) Great interview. I’d be afraid to live by Jason too. It’s cool that you jump right into another project. I wish I had your discipline. Good luck with your future projects.